Geneva Glen’s philosophy toward "Health Care" is derived from the first four letters of the word: HEAL. Our camp environment is one that adds health to the individual rather than subtracting illness from an individual. GG’s mission addresses the protection and development of the whole child, and health and wellness is a component that helps to sustain and promote the wholeness of the child / youth. Be sure that you are familiar and feel comfortable with these policies and practices. GG hires two camp nurses (at least one R.N.) for the summer to ensure that there is a nurse at camp at all times. For each camp session, a physician is available who: consults at camp Check-In, backs up the camp nurse for any problems and further consultation and remains on-call through the session. 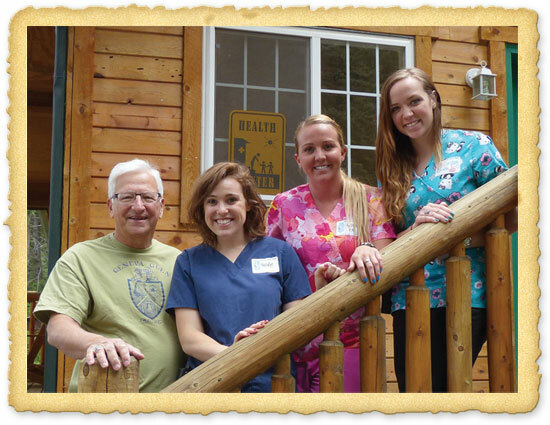 Our Health Center is centrally located and is a camp care facility, with isolation and treatment areas. Our nurses schedule hours for routine or non-urgent medical needs and remain on call round-the-clock for emergencies. The GG Health Center provides first aid and treatment for minor acute health problems. This care includes treatment for cuts, bruises, splinters, mild cold symptoms, conjunctivitis and other common or non-serious conditions. The camp provides rapid strep tests and, if needed, can obtain appropriate antibiotics. For all other conditions, the child will be seen in a nearby medical facility, depending upon the severity of the illness. The Geneva Glen medical staff can administer only medications that are prescribed by an MD/DO, and these meds must be in their original prescription container. Scheduled medications are distributed outside of the dining hall before meals and over-the-counter PRN (as needed) medications such as Acetaminophen, Ibuprofen, Benadryl, Zyrtec, Claritin, antacid, cough medicine, are provided by the camp and can be obtained at the Health Center during open hours. Please make sure that the medications you would like to administer to your camper match the medications listed on the Examination Form completed by your health care provider. No vitamins, minerals, supplements or homeopathic medications will be accepted or administered at camp unless prescribed by licensed medical personnel. If a camper needs over-the-counter medications administered on a regular basis (ie, Miralax, Zyrtec, etc. ), it must be documented properly on the Examination Form completed by the camper’s health care provider. Staff and campers are not permitted to keep medications or supplements (i.e. vitamins, dermatology creams, etc.) of any kind in their trunks, cabins or dorms. Geneva Glen is served by local ambulance and fire-fighting personnel who are dispatched from a station within a few miles from camp, and respond quickly to emergencies. GG is located within 20 minutes of an urgent care medical facility and two major hospitals in Denver. he Health History form, along with all of the other necessary camp forms, are found in our online form system, Camp-In-Touch. After receiving your enrollment confirmation, you will have access your account at www.genevaglen.org/forms. This system helps us to ensure the security of your family’s personal information as well as assist the medical team at camp during the summer. If you have questions about the system or need technical assistance, please email Johnny Domenico at johnny@genevaglen.org. The GG Health History and Examination Form must be completed prior to camp for all campers and staff. When Do You Need a Physical? The Physician's Exam form must be submitted every year, must indicate that a physical exam has taken place within 12 months of your child's attendance at camp and must be filled out AND SIGNED by "Licensed Medical Personnel" (MD, DO, Nurse Practitioner, Physician Assistant). You may access the form through your Camp-In-Touch account, where it can also be uploaded when completed and signed, or also submitted through mail, email or fax to the contacts listed on the form. If you have any questions, or if you need a supplemental form, contact the GG administrative staff before the summer season starts. Christian Science campers are exempted from the physician exam requirement but must submit an authorized waiver. 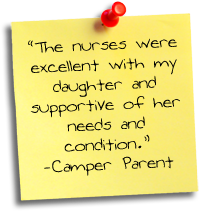 The camper's health history with parent signature still is required for admission. Geneva Glen serves full meals to over 325 people three times per day! The Camp’s menus meet the most recently revised recommended daily allowances of the Food and Nutrition Board, National Academy of Sciences, and National Research Council. We do our best to serve nutritionally balanced meals that also are appropriate from a caloric standpoint. All meals are served family style at the same times each day. 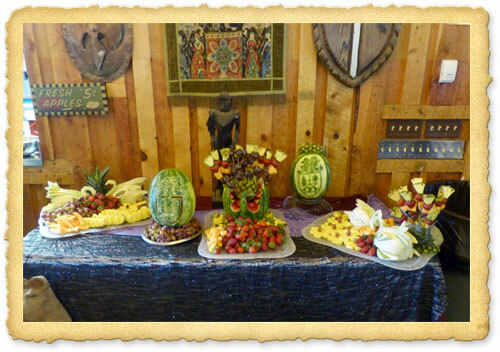 Vegetarian alternatives are provided for campers and staff who have listed special dietary needs on the Health History. Geneva Glen is not a therapeutic camp and provides meals similar to those found in most schools. We cannot guarantee the absence of peanuts or other allergens in the meals. We serve healthy, balanced meals. *** In accordance with state health regulations, we cannot permit parents to bring any food that requires refrigeration or freezing or specialized preparation (such as boiling or microwaving). With special cases that have been reviewed by our camp Physicians, we can accommodate a reasonable amount of dried food items (such as bread, cookies, cereal) that are gluten-free, but campers are expected to pick-and-choose the specific food items they can eat in a manner similar to what they do at school or a restaurant. Geneva Glen assumes that your camper is able to participate in all camp activities, and this expectation includes the ability to partake in camp's nutritionally balanced menus without extensive restrictions or limitation. If your camper has a significant allergy condition, you must indicate this on the health form. If you need to further consult a camp physician, please contact Johnny Domenico (johnny@genevaglen.org; 303-697-4621, x 13) and he will help arrange for a personal call with one of the camp doctors concerning your child’s condition. Feel free to contact the camp any time with questions. On Geneva Glen Check-In days, all parents start at Step 1 to confirm your financial record. From there you will be directed to Step 2 (located in the Health Center) if: (1) you have medication to drop off (see below); (2) your child has had symptoms of communicable illness in the previous 72 hours; or (3) the GG medical staff needs to clarify anything with you. 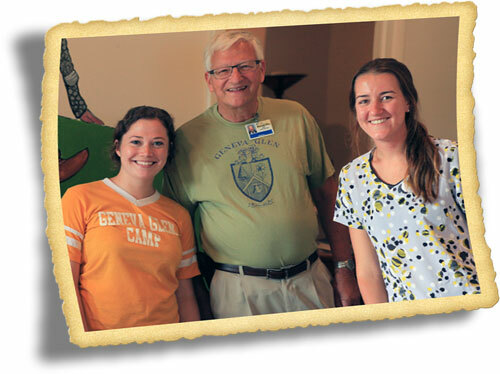 Parents wishing to have a private consultation with the camp medical staff may do so at the Geneva Glen Health Center, during Step 2 on Check-In days (feel free to notify the medical staff in advance, by calling 303-697-4621 x18 or by email: health@genevaglen.org). Parents of campers (or employees who are minors) are notified of potential health concerns identified in the screening process (i.e., immunization needs or other special needs). Should the camp staff observe something that concerns our camp nurse or camp physician, we will contact the parents. If a camper’s recovery deviates from the expected course of recovery. Under emergency circumstances, we will do what is best for your child. If your camper attempts self-injury, makes threats of suicide, exhibits violent behaviors, severely withdraws from activities or exhibits serious symptoms of an eating disorder, you will be notified. If your camper has a diagnosed behavioral disorder, it must be noted on the Health Form and the camp physician and camp nurse must be consulted on Check-In day. Typically, we will not contact you if your child is seen in the camp Health Center for routine problems (i.e., skinned knees, sore throat, conjunctivitis, headache, etc.) that do not require a physician referral. Please attach a letter to your child’s Health History if you wish for us to deviate from the procedures noted above. If Geneva Glen's healthcare provider determines that a camper needs a referral to an out-of-camp provider (i.e., physician, orthodontist) for routine health care (i.e., strep throat screen, ear infection or UTI), we will contact the parent or guardian by phone to discuss the situation and collaboratively determine the next course of action. Geneva Glen will attempt to contact you first by telephone and we will use any means available, including texting and e-mail. However, because of timing and scheduling conflicts, we cannot promise that we will be successful in reaching you. The phone numbers you provide on your child's Health Form and registration card are the numbers we will try first. When registering, please make sure that we know how to reach you during your child's stay by including cell phone numbers, home numbers, work numbers, pager numbers, temporary numbers used during vacations and e-mail addresses. We suggest that you and your designated emergency contact person keep your emergency phone powered on and available 24/7 while your camper is at camp.